SPAIN’S SHOWMAN extraordinaire, Javier Gurruchaga, is back on centre stage with a new La Orquesta Mondragón album. El Maquinista de la General is a tribute to trains, cinema, Buster Keaton (The General) and Gurruchaga’s recently deceased railwayman father – in short a magical mystery tour of rock, R&B, blues and jazz… with a Mexican flavour. The album comprises 17 tracks, performed by La Orquesta Mondragón in collaboration with various Mexican and Cuban artists. It includes the single Por Que No Te Callas, the famous phrase (“Why don’t you just shut up”) blurted out by King Juan Carlos to Hugo Chavez at the 2007 Ibero-American summit in Chile when the Venezuela President kept interrupting Spanish Prime Minister José Luis Rodríguez’s speech. Fronted by flamboyant San Sebastian-born singer, actor and TV presenter Javier Gurruchaga, La Orquesta Mondragón emerged from a radio jam session in 1976 and went on to become one of Spain’s most respected, albeit eccentric, bands – pioneers in the fusion of music and theatre. 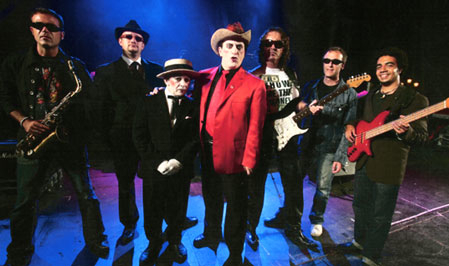 El Maquinista de la General is their 15th album, including three compilations.